Thank you to the 9:20 Special in San Francisco for this guest post. 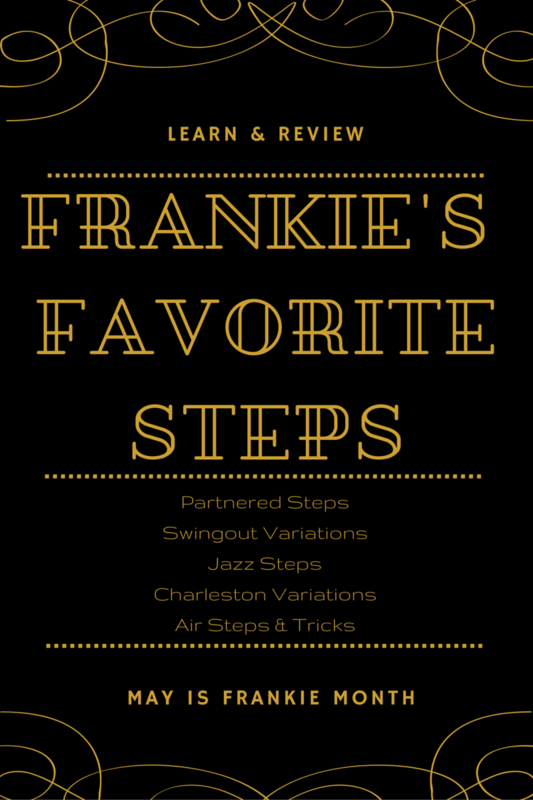 They’re organizing a Frankie Celebration as part of Frankie Month in May and this list of Frankie’s Favorite Steps is part of that effort. With Frankie Manning’s birthday coming up, some of us in San Francisco thought it would be helpful if we all had a list of “iconic” Frankie Manning steps, for use in teaching about Frankie and choreographing performances in his honor. Surprisingly, such a list does not seem to exist. After all, while very few of might be able to perform “Hellzapoppin,” we can all Peck, Messaround and Slip Slop in Frankie’s honor for his birthday. Laura Jeffers is the director of the Big Apple Lindy Hoppers, the New York City-based performance troupe co-founded by Frankie Manning. Laura trained for many years under Frankie Manning, and continues to share and teach his choreography and steps. Laura put together this list of Frankie Manning favorite steps, e.g. not steps that Frankie invented (although he did invent some of them), but ones that he performed, taught and choreographed often. Laura has also helpfully including video links for some of the steps that might be unfamiliar to some. This list is not meant to be exhaustive but inspirational. Please use this as a starting point for teaching about Frankie Manning, creating new choreographies inspired by him, and sharing his legacy wherever you are. Feel free share widely and to provide us feedback and questions to our Twitter, Facebook or to news@yehoodi.com.